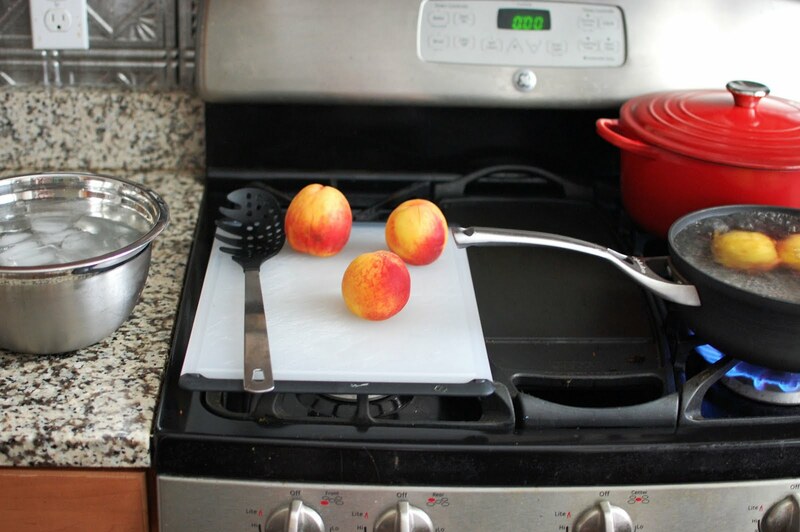 You know how some cooking steps just aren’t worth the hassle? Like sifting dry ingredients. In most recipes, you can just run a whisk or a fork through them and call it a day. Others, are definitely worth the extra time and effort. Seeding tomatoes for salsa is must in my book. Then there are others that are just so darn simple, there’s no reason not to do them. 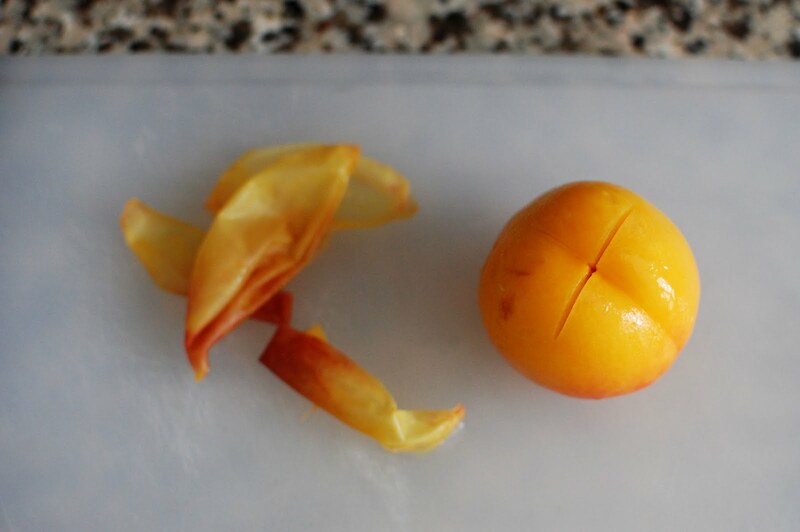 Peeling peaches falls into the last category. Sometimes it’s intimidating to see that you need to do an extra step, especially if you’ve never done it before. 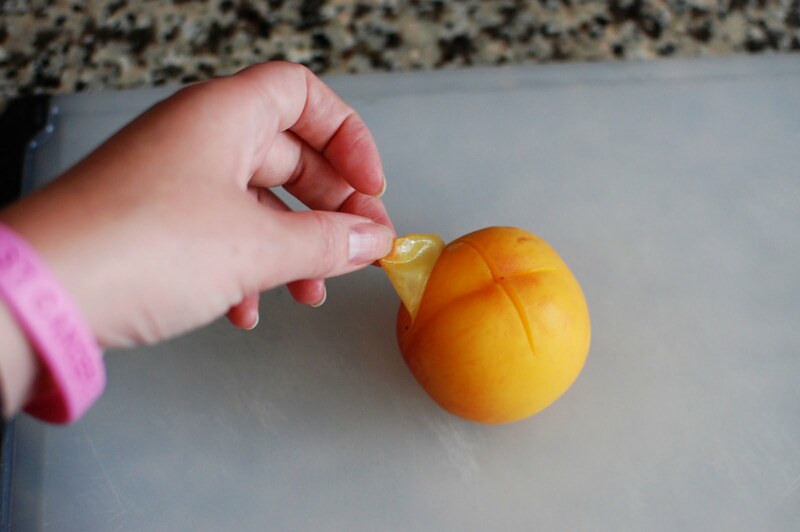 But I’m here to show you how simple it is to peel a peach. First, get everything ready to go. 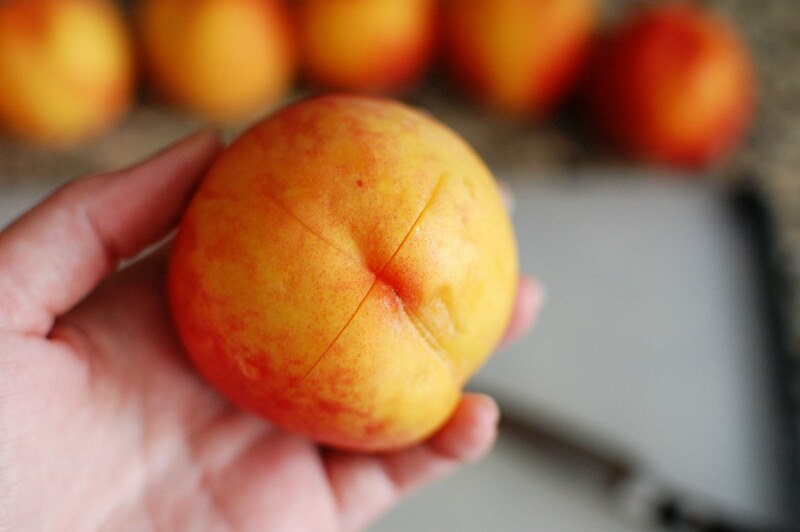 You’re going to need a bowl with some ice water, a pot of boiling water, some fresh peaches, a paring knife, and a slotted spoon. Set the water to boil. While it is heating up, cut an “X” into the bottom of each peach with your paring knife. 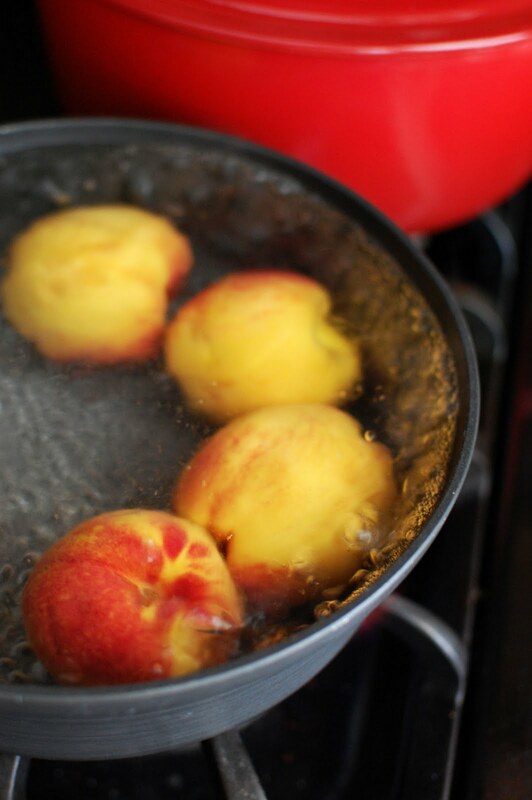 Once the water is boiling, drop the peaches into the boiling water. 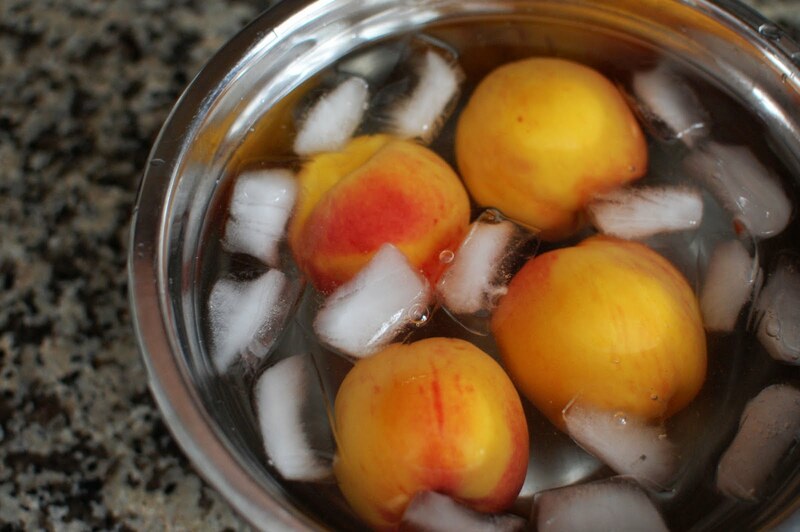 Make sure the peaches are fully submursed in the water. Boil for about 35-45 seconds. Remove the peaches with a slotted spoon and immediately transfer to the ice bath to prevent cooking the peaches. Now the skin of the peaches can be peeled off with your hands. See! Wasn’t that simple? 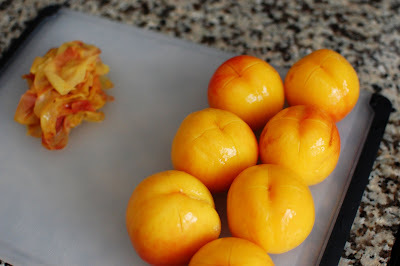 Be sure to come back tomorrow to see what I made with my peeled peaches. 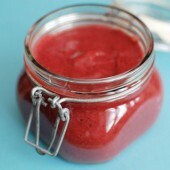 I made this recipe and used a combination of blackberries, raspberries and strawberries. It was wonderful. 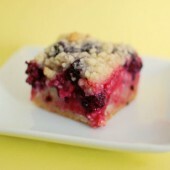 Loved the crust topping! 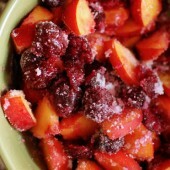 What can I used instead of cinnamon chips ? i never seen cinnamon sold that way. I can used cinnamon powder the same amount ?